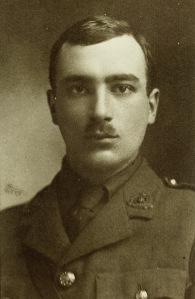 Lesley Ford introduced the distressingly commonplace story of a brave young man, Robert Quilter Gilson (photo above), in the first world war. An undergraduate at Trinity College Cambridge, he volunteered for service in the autumn of 1914. Followed a period of training and preparation, culminating in deployment to the trenches. At 07:30 on 1 July 1916, the start of the battle of the Somme, he was one of the first over the top, and within the first ten minutes he was killed by a shell burst. Less commonplace are the recollections of him preserved in his family, and particularly his letters home. These were presented by some of Gilson’s relatives who attended our meeting, and extracts from the letters were movingly read by an actor. The young man who emerged was sensitive, cultivated, thoughtful, self-aware: this was no Colonel Blimp. One of his major concerns was whether he would measure up. At Trinity he had been in the Officer Training Corps, so he was commissioned as a junior officer on joining up. Was he fitted to command his men, he asked himself, and perhaps send them to their deaths? Would he panic amidst the terror of battle? Could he earn the liking and respect of his men, many of them older and more experienced than himself? The record shows that in his final battle, his superior was killed almost immediately and he took command calmly and effectively before himself being killed. Letters of condolence to his grieving family show he was well-regarded by his men and his fellow-officers. In the weeks of waiting before his final battle, Gilson’s letters include his reflections on the beauties of nature and the contrast with the thunder of nearby artillery. They show his concern for his men’s welfare, and reflect his pride in his professional skill, particularly in organizing the construction of well-designed trenches. He hated the winter mud, which got everywhere: it coated the pages of books, for example, so it was impossible to read. After the talk, in a small display we were able to see some of Gilson’s letters, sketches (he was a talented draftsman and had been studying architecture), and personal items, such as his binoculars, miraculously preserved. We could appreciate Gilson as a person, not just a casualty statistic. Never again was the cry. In families such as the Gilsons, there’s still a live connection with those who suffered and died in Flanders and elsewhere. Yet with current levels of hostility and distrust between peoples, we seem to be forgetting the lesson of their sacrifice.